The Moodle text editor can be changed from its default, ATTO, to TinyMCE, which may be preferable to instructors with foreign languages. 1. Log in to Moodle and hover over your name at the top right corner of the page, then hover over the Preferences option. Then, select User. 2. Many lists of options will be displayed. 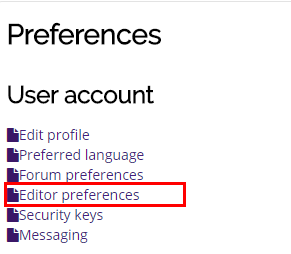 Click the Editor preferences link, located in the left center area in the first list. 3. Select the desired text editor, then click Save Changes at the bottom.